The U.S. Environmental Protection Agency says the District’s government, businesses, institutions, and residents collectively purchase nearly 760 million kilowatt-hours of green power annually, making it the largest Green Power Community in the nation. More than 8 percent of the electricity sold in the District comes from green power. The city government alone purchases 244 million kilowatt-hours of green power annually, or 50 percent of its total municipal load. The only other city to receive the 2011 Green Power Community of the Year Award is Portland, Oregon. Read about the Green Power Leadership Awards. Regulators in Virginia have approved a fee, requested by Dominion Virginia Power, on homeowners who install solar arrays of 10kw or more. Dominion’s rationale for this “standby” fee, according to a Virginian-Pilot article, is that they still “must maintain the poles, wires and operating equipment” for customers who generate their own electricity through solar power. Dominion currently has only one residential customer whose solar array is large enough for them to impose the fee. That has led smaller customers to worry that the company will use the approval as a stepping stone to request the fee for all residences with solar in the future. The one customer who qualifies for the fee says it amounts to 20% of his electrical cost savings, a heavy penalty to pay for switching to solar. Virginian-Pilot article by Carolyn Shapiro. Montgomery Countryside Alliance recommends we take some time this winter to learn about buying food direct from the source. Community Supported Agriculture (CSA) has been around for 20 years, and provides a model (with variations) that benefit both consumer and farmer. Read about CSAs here. View a list of local CSA farms here. Frostburg State University has begun construction on a new Sustainable Energy Research Facility (SERF) that will support the research, education and community outreach programs of the FSU Renewable Energy Center. The facility will serve as an example of an energy-efficient, sustainable building for homeowners, farmers or businesses in western Maryland. The 6,300 square foot SERF, built with the aid of US DOE grants, will generate its own electricity from solar and wind power, and solar thermal collectors and geothermal energy will be used for heating, cooling and air conditioning. MCDOT Public Meeting: Proposed Bikesharing Initiative along Metrorail Red Line, Tuesday, Nov. 29, 6:00 – 8:30 pm., lobby auditorium of the Executive Office Building, 101 Monroe Street, Rockville. Staff is seeking your input on bike sharing locations from the DC line to the Beltway along both Montgomery County portions of the Metrorail Red Line. More information here. Talk: “An Ozone Monitoring Garden,” Tuesday, Nov. 29, 7:30 pm, Kensington Park Public Library, 4201 Knowles Avenue, Kensington. Monthly meeting of the Maryland Native Plant Society. Speaker Jeannie Allen is a Science Education Specialist for Sigma Space Corp at NASA Goddard. In summer, our area experiences ozone levels that are well above what is healthy for plants, animals, and people. Several common native plants are sensitive to ozone and, when over-exposed, show specific changes in their leaves. Learn how ozone is formed; how to recognize ozone damage and which plants may show it; hear an update on our regional air quality based on NASA observations of Earth from space. There will be refreshments. Pot luck refreshments are always welcome. Bring native plants for “give-a-ways.” Sign up to attend. Lighting the Way to a Greener Community! First Thursday Happy Hour, Dec. 1, 5 – 8 pm. Redwood Restaurant and Wine Bar, 7121 Bethesda Lane. An evening of casual conversation and networking with Bethesda Green and Greater Washington Interfaith Power & Light. Learn what local congregations are doing to save energy and go green. Complimentary vegetarian appetizers, Happy Hour drink specials. Contribution: $10 at the door will support both organizations. RSVP. Maryland 2012: Legislation to Protect our Air, Land, Water, and People, Monday, Dec. 5, 6:30- 8:30 pm, Salisbury University, Guerrieri University Center – Nanticoke Room # 236, 1101 Camden Ave. Salisbury, MD 21801. 2012 will be a year with a continuing tough economy and budget cuts affecting our environment. Learn the issues from leaders in the environmental community, share what you think should happen in Annapolis, and hear from our elected officials. Refreshments will be served. RSVP for this FREE event. Maryland-Asia Environmental Partnership (MD-AEP), 3rd Annual Energy and Environmental Leadership Series Banquet, Tuesday, Dec. 6, 6 – 9 pm. Institute of Marine and Environmental Technology (home of the world’s first sustainable aquaculture system), The Columbus Center, Baltimore. Philippines Ambassador to the United States, The Honorable Jose L. Cuisia will keynote the event. Also expected to attend are MD Secretary of the Environment Bob Summers, Secretary John Griffin of DNR, Chesapeake Bay Commission Director Ann Swanson and key Environmental Committee members of the MD General Assembly. Tickets are $90. When registering, type “BethesdaGreen” when prompted for a discount code and receive a $15 discount. More information and registration. Bethesda Green Education, Outreach and Marketing (EOM) Group Meeting – Newcomers Welcome! Wednesday, Dec. 7, 4:00 – 5:30 pm at Bethesda Green, 4825 Cordell Ave., corner of Woodmont Ave., Suite 200, above the Capital One Bank. A team of volunteers, EOM supports all of Bethesda Green’s communication efforts. From recycling to energy efficiency, sustainability to green building/design, EOM expresses the organization’s various areas of expertise in a clear and concise manner via various media. New members are welcome to join. More information here, or contact Bethesda Green Communications Director Dave Heffernan, dvheffernan@bethesdagreen.org. Rockville based SEED Green Homebuilders has announced plans to build the company’s first net zero home at 5709 Lone Oak Drive, near Fleming Park in North Bethesda. A net zero home is one that produces as much energy as it consumes. According to the company Website, the 5,500 sq.ft., 6 bedroom home will be equipped with a planned 3kw solar electric system, solar hot water heater, an energy recovery ventilation (ERV) system and high efficiency, Energy Star HVAC equipment. An energy-efficient building envelope will protect the home from outdoor temperature fluctuations. This is one film sequel we think will be well worth seeing. Chris Paine, who gave us the documentary film, Who Killed the Electric Car?, takes his film crew behind the closed doors of Nissan, GM, and Tesla Motors to chronicle the start of a era of electric cars. Revenge of the Electric Car follows the race to be first, best, and most iconic. The new documentary features CEO and President of Renault/Nissan Carlos Ghosn, CEO of Tesla Motors Elon Musk, Former Vice Chairman of GM Bob Lutz and EV do-it-yourselfer Greg “Gadget” Abbott. Revenge of the Electric Car plays for one week only starting this Friday, November 25 at the E Street Cinema in the District. View the trailer here. Beginning January 1, Montgomery County retailers will charge five cents for each paper or plastic bag they provide to customers. The county government wants us to be ready for the change, and has created a thirty second video reminding us to bring our own reusable bags. The video informs us that “plastic bags are the single biggest source of waterway litter” that costs Montgomery County taxpayers $3 million a year to clean up. Spend 30 seconds here. “Shopping Green and Local Holiday Fair,” Saturday, Nov 26, 10:30 am – 4:30 pm, Amicus Green Building Center, 4080A Howard Ave, in the West Howard Antiques District of Kensington. Amicus invites you to shop for green, healthy, and locally produced holiday offerings. They will have home goods and tools for eco-cooks and energy geeks; gift wrap and stationary (how about note paper made from recycled beer grain! ); eco-travel options; adventure tours; Capital Bikeshare memberships; and other surprises. As a bonus, AmEx card members who register their card online (here: https://sync.americanexpress.com/sbs2011) and spend $25 will get a $25 statement credit from AmEx. Talk: “An Ozone Monitoring Garden,” Tuesday, November 29, 7:30 pm, Kensington Park Public Library, 4201 Knowles Avenue, Kensington. Monthly meeting of the Maryland Native Plant Society. Speaker Jeannie Allen is a Science Education Specialist for Sigma Space Corp at NASA Goddard. In summer, our area experiences ozone levels that are well above what is healthy for plants, animals, and people. Several common native plants are sensitive to ozone and, when over-exposed, show specific changes in their leaves. Learn how ozone is formed; how to recognize ozone damage and which plants may show it; hear an update on our regional air quality based on NASA observations of Earth from space. There will be refreshments. Pot luck refreshments are always welcome. Bring native plants for “give-a-ways.” Sign up to attend. Lighting the Way to a Greener Community! First Thursday Happy Hour, Dec. 1, 5 – 8 pm. Redwood Restaurant and Wine Bar, 7121 Bethesda Lane. An evening of casual conversation and networking with Bethesda Green and Greater Washington Interfaith Power & Light. Meet GWIPL Director Joelle Novey, and learn what local congregations are doing to save energy and go green. Complimentary vegetarian appetizers, Happy Hour drink specials. Contribution: $10 at the door will support both organizations. RSVP. I met Nikki Rose recently at Yamas Mediterranean Grill with owner Tony Alexis. The three of us sat down to discuss Nikki’s new book and Tony’s Greek traditions as we munched on stuffed grape-leaves, olives, and tzatziki. “Many people around the world are striving to ‘return to the land,’ while many people in rural Crete have never left the land,” chef and author, Nikki Rose describes of her homeland. This Greek American author has demonstrated for more than 15 years that the nutritional benefits of the cuisine of Crete can be applied wherever we live. 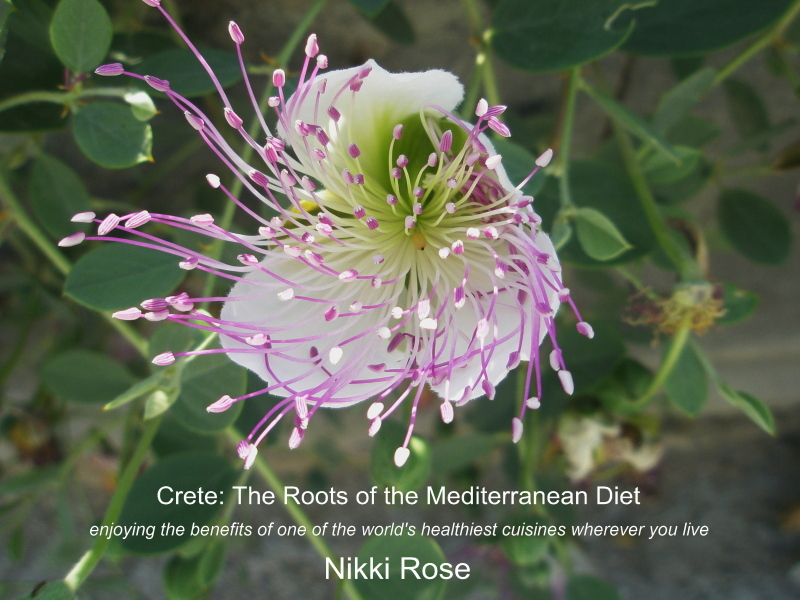 In her new book, Crete: The Roots of the Mediterranean Diet, Nikki draws many parallels with her family home of Crete to the growing interest of eating a healthier diet based on non-commercially processed, fresh, seasonal, and sustainably-grown food in the U.S.
Nikki organizes seminars and study abroad programs in Crete through her program, Crete’s Culinary Sanctuaries (CCS). She has received numerous awards from National Geographic, the United Nations Convention on Biodiversity and many other organizations for her success in creating sustainable travel, community-based tourism and culinary seminars that bring focus to the expanding inquiry into sustainability. Her book is a culmination of her experience and work on the island. Located in the eastern Mediterranean Sea, Crete is the largest island in Greece and the southernmost island in Europe. With its snow-capped mountains, mild and rainy winters, and summer temperatures averaging 85 degrees Fahrenheit, the island’s climate supports over 4,000 years of agricultural practices. Olive oil, whole grains and beans, and a variety of vegetables, fruits, and herbs grown in Crete form the basis of the classic Mediterranean diet—widely touted as a much healthier cuisine than the heavily processed, industrially-raised meat, and fast food that many Americans have embraced for more than half a century. Nikki promotes dining the Cretan way centered on Meze, or small plates of a variety of foods, much of which is served raw or cooked simply, which is ideal for busy people. She also sees Meze as a perfect way to introduce children to a variety of foods. “Serve produce first and children will eat more of it before they get distracted or load up on meat and starch and nothing else,” Nikki writes. The author invites us to experience the rhythm of the seasons through narrative and beautiful photos, and introduces us to how food is traditionally prepared. 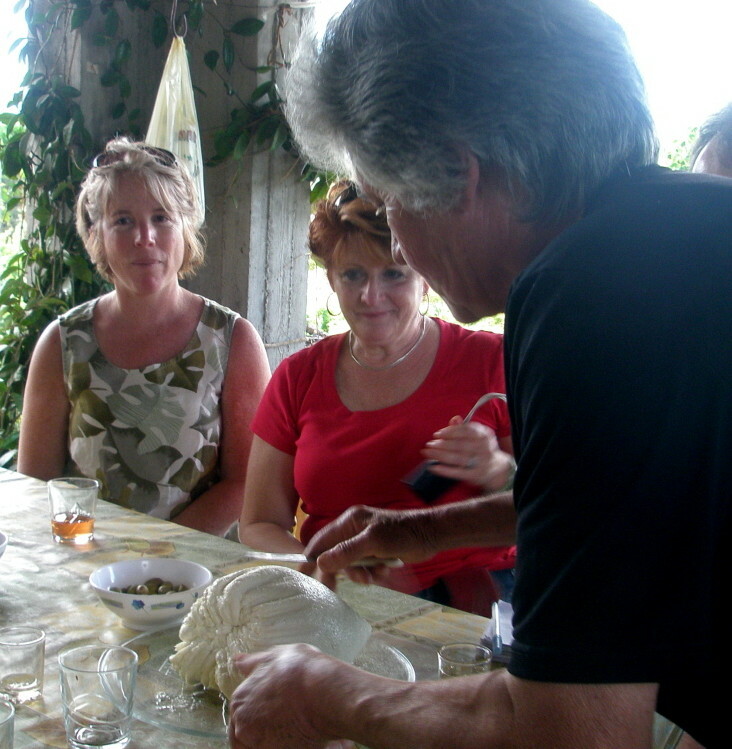 Nikki describes the wonderful flavor of zucchini blossoms, fava beans eaten raw as a snack, and mizithra, a fresh cheese. Seasonal favorites include figs, lemons, oranges, apricots, pomegranate, walnuts and almonds. Fisherman pull octopi out of their hiding places and bedazzle observers by tenderizing their catch on the rocky coast. When the annual rains return in autumn and winter, horta or wild greens burst forth, olives are harvested and pressed for oil, and grapes are distilled into a spirit called raki—a symbol of hospitality that is also used in natural medicine. Nikki and Tony will bring the flavors of Crete to Bethesda on December 11th. Nikki will share her knowledge about the culture and cuisine of Crete at Bethesda Green. Autographed copies of her book will be available for sale at the event or can be ordered online at www.cookingincrete.com. Proceeds benefit ongoing CCS initiatives. Afterwards, Tony will cook up a special Greek brunch from his native country. Join us for this fascinating and delicious celebration of the cuisine of Crete. Reservations required for both events. Register here; for more details call (301) 312-8384. This event is co-hosted by Yamas Mediterranean Grill, Bethesda Green, and Full Plate Ventures. Yamas Mediterranean Grill Yamas means, “to your health”. Owner Tony Alexis celebrates his Greek heritage by serving this healthy, delicious cuisine in downtown Bethesda. Bethesda Green, incubates, educates, and initiates by connecting business, government and community through programs and services to promote a healthy economy and sustainable living practices in order to reduce our collective impact on the environment. Full Plate Ventures provides business consulting to social enterprises to enhance their profitability while serving their social mission. 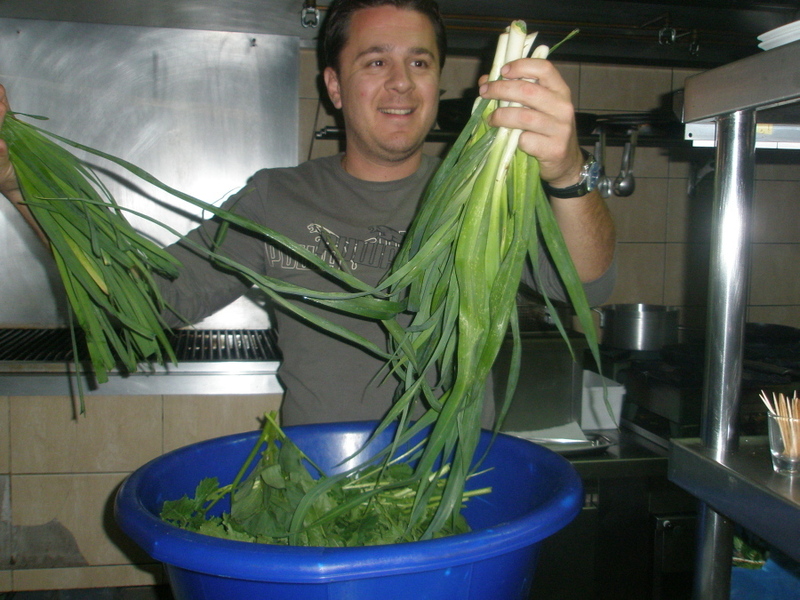 Crete’s Culinary Sanctuaries Eco-Agritourism Network is an award-winning educational travel programs celebrating Crete’s cultural and natural heritage. featuring dishes celebrating the flavors of Crete. Register here for both events; for more details call (301) 312-8384. The Washington Area Bicyclist Association (WABA) has published a “call to action” directed to area bicyclists and bicycling activists. Published in a 30 page PDF document on the group’s Website, the stated purpose is to make bicycling “a viable form of transportation for a much broader segment of the population.” WABA calls for “some unity among the many planning bodies, transportation agencies, and advocacy/advisory groups” in the Washington area in order “to move beyond simply making bicycling possible” and to fully integrate it into our regional transportation network. The PDF lays out how bicycling advocates can position themselves to help the region move toward that goal. Non-profit home builder, Habitat for Humanity of Montgomery County (HFH-MC), now offers home weatherization services for county homeowners who cannot afford to pay someone to perform needed repairs and do not have the knowledge to do the repairs themselves. The aim is to reduce the homeowner’s electric, gas and water bills. Weatherization includes stopping air leaks from windows and doors, insulating attics and crawl spaces, replacing light bulbs with CFLs, installing low-flow shower heads, and similar services. Eligibility for assistance depends on household income and number of family members. For a family of four, for example, annual household income must be less than $67,600. The homeowner must be willing to contribute up to 10 hours for education and sweat equity in the project, which is carried out by Habitat staff and volunteers. Individuals and families interested in applying should contact Teresa McCoy at 301-990-0014 x 19, or download the application. Tens of thousands of volunteers throughout the Americas will participate in the Audubon Society’s 112th Christmas Bird Count from December 14 through January 5. 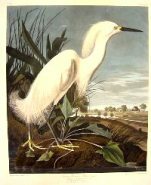 The first Audubon census involved 27 people on December 25, 1900. Audubon and other organizations use the data collected to assess the health of bird populations – and to help guide conservation action. Information about the bird count, including how to get involved, is on the Audubon Website. 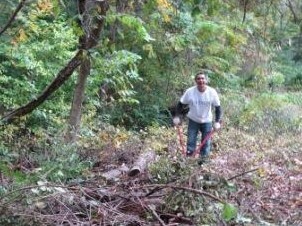 Volunteers are needed from noon to 4 p.m. on November 19 and 20 to help build a new, quarter-mile section of the Northwood Chesapeake Bay Trail that will connect Northwest Branch and Sligo Creek parks. The new trail portion will be on the Breewood Property, located at the southeast corner of Sligo Creek Parkway and University Boulevard behind the Norwood Church. The project is a partnership between the Montgomery County Department of Environmental Protection, the Potomac Appalachian Trail Club, Northwood High School, Neighbors of Northwest Branch and Montgomery County Department of Parks. Volunteers are needed each day to clean up litter, build stepping stones across a small stream, remove small roots and debris along slopes and, in difficult soil, blaze the trail and cut heavy invasive vines. Meet at the front entrance to Northwood High School, 919 University Blvd., Silver Spring. Students can earn Service Learning hours for their work. Email Jennifer Chambers, the project coordinator, at jennifer@hikingalong.com. Free Screening of Documentary, Green Fire: Aldo Leopold and a Land Ethic for Our Time, Monday, Nov. 14, 7:30 pm, TC Williams High School Rotunda (second floor), 3330 King Street, Alexandria. This screening of the first full length documentary about the legendary conservationist, ecologist and author of The Sand County Almanac is presented by Northern Virginia Conservation Trust, Go Green Alexandria, TC Williams HS Environmental Club, and Equinox Investments. Read about the movie here. Registration, directions and important note about parking posted here. Virtual Town Hall. Live Internet Discussion with County Executive Ike Leggett, Wednesday, Nov. 16, noon – 1 pm. Get your questions ready and send them in advance. More info here. Montgomery County’s first “Know Your Farmer,” Call-In Webinar, Wednesday, Nov. 16, 8 pm. Montgomery Victory Gardens hosts “Challenges and Opportunities Facing Organic Agriculture in the 21st Century,” a discussion with Montgomery County farmers Nick and Sophia Maravell. Nick is the operator of Nick’s Organic Farm in Potomac and one of only four farmers sitting on the prestigious National Organic Standards Board, while his daughter Sophia, who has studied organic agriculture throughout the world, is one of our nation’s new generation of aspiring farmers. Register here. Home Energy Efficiency Workshop, Thursday, Nov. 17, 6:30 – 8:30 pm., Silver Spring Civic Center. Silver Spring Green invites you to learn more about energy audits, making retrofits to winterize your home and how energy efficiency can save you money! Driving directions and registration. Montgomery County Green Business Crash Course Webinar, Nov. 17, 8 – 11 am. Offered in partnership by Montgomery College and Montgomery County Chamber of Commerce. The course instructor will guide you through the application process to accelerate your certification. More info and registration. Keystone XL Pipeline — Bad for the Environment and Our Health — Where Do We Go From Here?, Nov. 19, 6 – 10 pm. Presented at Cedar Lane Unitarian Universalist Church in the sanctuary, 9601 Cedar Lane, Bethesda, MD 20815. Event includes potluck dinner and a panel discussion after showing two movies about the Keystone XL pipeline by Academy Award nominee Leslie Iwerks: “Pipe Dreams,” about the environmental devastation of tar sands; and “Downstream,” about a doctor’s valiant efforts to save the health of an aboriginal community in Canada affected by tar sands. RSVP to: Molly Hauck, mollyhauck@verizon.net or 301-949-0178. Shred and recycle your confidential paper and donate reusable clothing and household goods in working condition. Partners in these events are, Office Paper Systems, A Wider Circle, Interfaith Clothing Center, and NAMI Montgomery County. Volunteers welcome. More information and guidelines.